Disclosure: This is a post prepared under a contract funded by the Centers for Disease Control and Prevention (CDC) and written on behalf of the Mom It Forward Influencer Network for use in CDC’s Get Ahead of Sepsis educational effort. Opinions on this blog are my own and do not necessarily reflect the views of CDC. Anyone can get an infection and virtually any infection can lead to sepsis. Sepsis is a life-threatening medical condition that impacts more than 1.5 million Americans each year, and at least 250,000 people die as a result. It’s the body’s extreme response to infection and it can happen to anyone at any time. 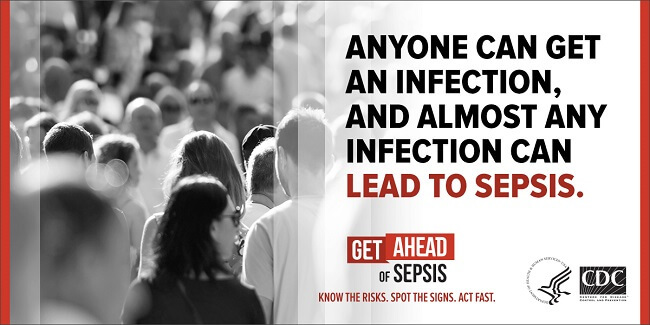 Infections put you and your family at risk for sepsis. If you or loved one has an infection that’s not getting better or is getting worse, seek emergency medical care immediately. If you or a loved one are experiencing one or more of the symptoms listed above, it’s important to seek EMERGENCY medical care at once. Sepsis can develop from almost any infection in your skin, respiratory system, digestive system or anywhere else. It triggers a chain reaction through your entire body that can lead to rapid tissue damage, organ failure, and death. 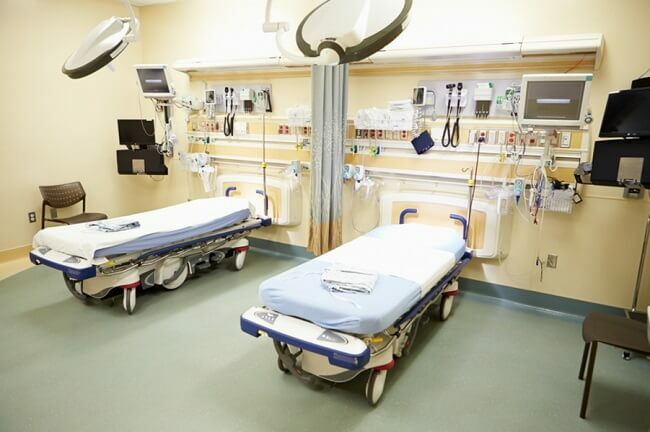 Regardless of whether it develops from a skin infection from an ingrown toenail or a bad cough that turns into pneumonia, sepsis is a deadly serious condition that requires immediate medical intervention. The year before last, I came down with a severe infection caused by something I ate. I could have easily gone to the doctor, but I delayed treatment thinking it would work itself out eventually. After a few weeks, my symptoms were not only still present they were getting worse until one day I ate a spicy meal that pushed my body past the tipping point. Shortly after getting home, my symptoms went into overdrive. I began to experience severe cramping, bloating, pain, and many of the symptoms on the list. When my wife noticed me writhing around in the bedroom she brought me to the hospital where I ended up staying for three weeks after being diagnosed with infective colitis. Once my infection was under control I was released. I thought I was in the clear but unfortunately, I ended up being admitted two more times for even more serious conditions— C. diff and sepsis. 2016 was rough for me. I spent a little over two months out of the year lying in hospital beds getting pumped full of antibiotics, fluids, and living off liquid diets. If I never smelled another cup of beef or chicken broth for the rest of my life, I’d be fine with that. To this very day, the thought of sucking down another quivering cup of gelatin sends shivers up my spine. Delaying treatment cost me dearly but I could have paid for it with my life. While it’s true that anyone can get an infection and almost any infection can lead to sepsis, certain populations are at a greater risk. The elderly, people with chronic medical conditions, those with weakened immune systems, and children younger than one are all at an increased risk. It’s important to know the symptoms so you can ACT FAST and get emergency medical care IMMEDIATELY. Get Ahead of Sepsis is the CDC’s first national effort focusing on early recognition, prompt treatment, and prevention of infections that can lead to sepsis. 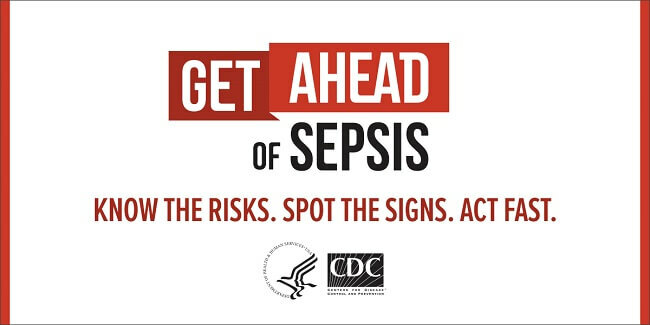 CDC is providing educational materials and resources for patients, families, and healthcare professionals to know the risks, spot the signs, and act fast if sepsis is suspected. Ask your doctor or nurse about steps you can take to prevent infections. To learn more about sepsis and how to prevent infections, visit www.cdc.gov/sepsis. For more information about antibiotic prescribing and use, visit www.cdc.gov/antibiotic-use.